Peanut butter whoopie pies – soft chocolate cakes stuffed with peanut butter marshmallow filling. They’re a wonderful treat with a funny name. I grew up in the Northeast near Amish country. 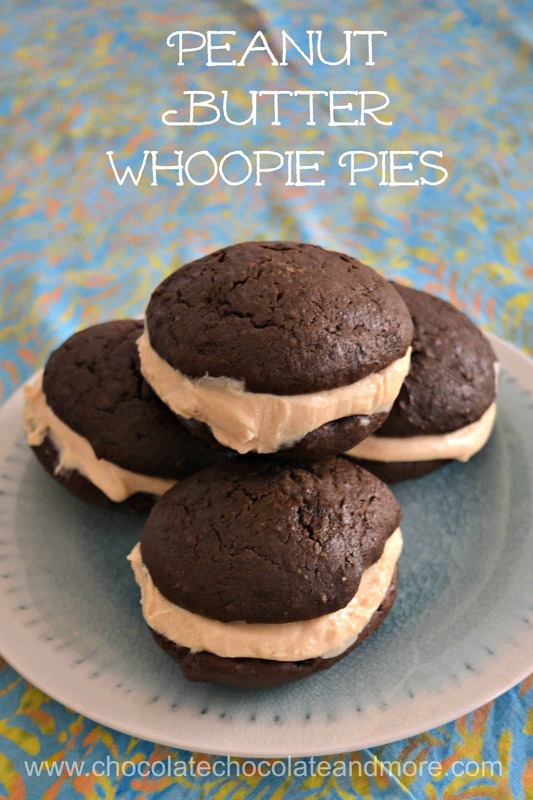 The Amish make a wonderful treat with a funny name – whoopie pies. Traditional whoopie pies are two dark chocolate cakes with large amounts of marshmallow filling in between. I guess the name came from how large they are. Amish whoopie pies are the size of your hand. Since I was craving peanut butter and chocolate, I thought I’d change up the traditional recipe with a little peanut butter. I made some more changes to these peanut butter whoopie pies. The filling is usually marshmallow creme, shortening and sugar. This is pretty greasy so I substituted cream cheese for the shortening. I also reduced the amount of sugar. Use a cookie scoop to get even sized pies. I made some small ones (about 2″ in diameter) with a medium cookie scoop and large ones with a large scoop. These changes made my filling a bit soft so it needs to be made first so you can chill it before filling the cookies. 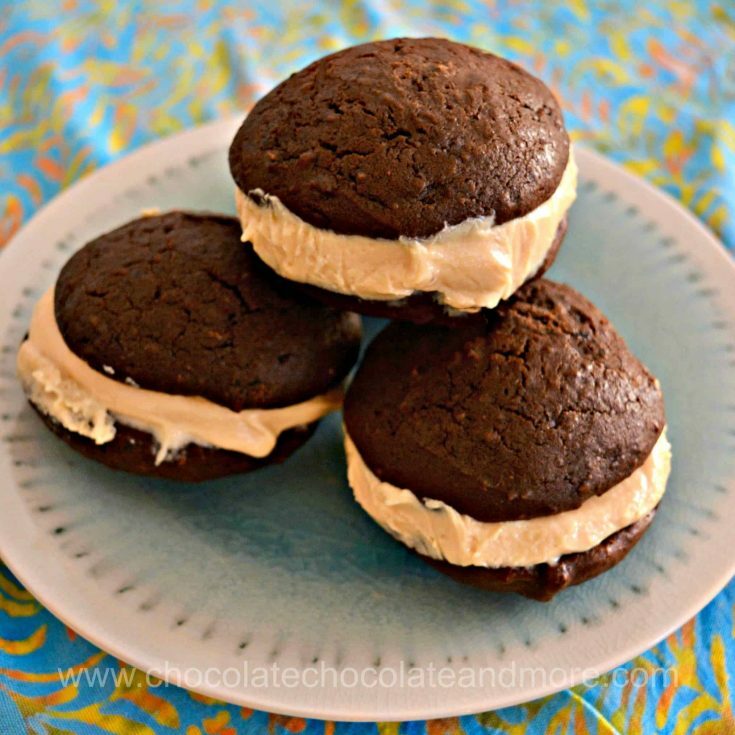 Since there’s cream cheese in the filling, you also need to store peanut butter whoopie pies in your refrigerator. I tried these out on my colleagues at work and some teacher trainees. My Australian colleagues couldn’t get over the name. They said it was similar to the Australian for “fart.” So they called these fart pies but they gobbled them up. Australians are a funny bunch. Peanut butter whoopie pies are a fun twist on the original and they’re a lot less sweet. I hope you enjoy these. Mix together all ingredients until smooth and well blended. Refrigerate while you make the cookies. Mix in the baking powder, baking soda, salt, chocolate extract, egg and cocoa powder. Mix in about 1/3 of the flour and then follow with 1/3 of the milk. Continue alternating flour and milk until all is mixed. The dough will be thick. Use a large cookie scoop to drop dough onto the parchment paper. Leave ample space for the cookies to spread (they will be about 3" wide). Bake for 10 - 12 minutes. The top should be springy like a cake. Cool on racks. Spread about 1 inch of filling on the flat side of the bottom cookie. Top with another cookie. Wrap in plastic wrap. Repeat for the remaining cookies. If you use a medium scoop, bake only for 5-7 minutes. If you see cracks in the tops, add a few tablespoons of milk to the batter. I make my “devil dogs” a little different from this one. And the cream is make from evaporated milk, butter, sugar, and vanilla. Makes a nice light cream. But I will try the peanut butter filling. Oooh, I’m going to have to try your way. That sounds wonderful!